For the shredded beef: Cook beef with vegetables and water in a pressure cooker for 30 minutes. Reserve a cup of broth and shred beef finely. Set aside. Sauté the onion, pepper, tomato and sweet chili pepper in hot oil in the same pot. Add Worcestershire sauce, cumin, garlic, tomato paste, broth, salt and pepper to taste. Add shredded beef. Cook for 20 minutes over low heat or until the liquid evaporates. For the black beans: Pour oil in a pressure cooker and sauté bacon, onion, pepper, sweet chili pepper and garlic for 5 minutes. Add cumin powder and cilantro leaves. Drain water from the beans and add them to the sautéed vegetables. Pour 4 cups of water and cook the beans with vegetables for 20-30 minutes. Release steam and remove the lid very carefully. Cook for 10 more minutes, without the lid until the liquid evaporates. For the plantain and cheese: Deep-fry plantain slices until golden brown and drain over paper towels. 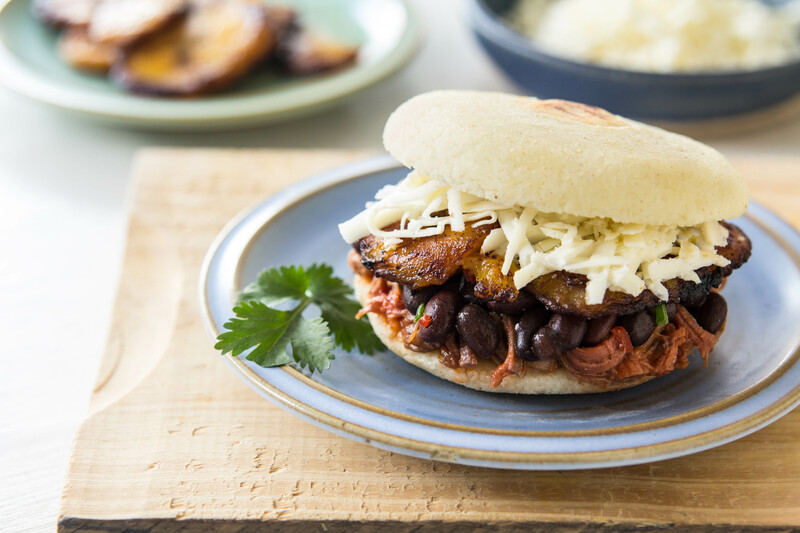 Fill each arepa with a portion of shredded beef, black beans, two fried plantain slices and grated white cheese..